EDMONTON, Alberta, Canada, May 17, 2016 (ENS) – Five new wildfires started in northern Alberta over the past 24 hours, and now a total of 17 wildfires are burning, with four blazing out of control. Fire conditions remain extreme in Alberta, where the Fort McMurray wildfire remains out of control. It is now estimated to cover 355,000 hectares (1,370 square miles). On May 1, a wildfire began southwest of Fort McMurray. 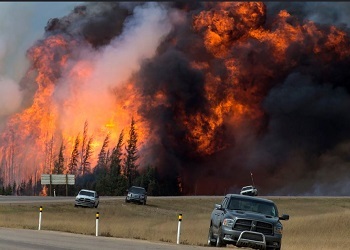 On May 3, it swept through the community, destroying 2,400 homes and buildings and forcing the largest wildfire evacuation in the province’s history. Roughly 88,000 people were evacuated. The only casualties were two people who were killed in a automobile collision during the evacuation. Fort McMurray, Anzac, Gregoire Lake Estates and Fort McMurray First Nation remain under mandatory evacuation orders. “My thoughts are with everyone affected by the wildfires. Our government is doing absolutely everything we can to ensure people are safe,” says Alberta’s Premier Rachel Notley. Premier Notley has declared a provincial state of emergency. The government and the Department of National Defence signed a memo of understanding on May 4, detailing required assistance and use of helicopters for rescue operations. There are 1,754 firefighters, 208 helicopters, 412 pieces of heavy equipment and 29 air tankers currently battling the wildfires. Yet, fires continue to spread across northern Alberta, devouring forested areas and halting Athabasca tar sands operations. Shell Canada has shut down output at its Albian Sands mining operation, located about 70 kilometres (43 miles) north of Fort McMurray. The company said its priority is to get employees and their families out of the region, and provide capacity at its work camp for some of the evacuees. Shell has offered its landing strip to fly employees and their families to Calgary or Edmonton and has provided two teams to support firefighting efforts in the area. Suncor Energy and Syncrude Canada have scaled back operations. Suncor’s Millennium and North Steepbank mines are two of the largest and oldest oil sands mining operations in the Fort McMurray area, and Syncrude’s Mildred Lake oil sands mine is located 35 kilometres (21.7 miles) north of Fort McMurray. The two companies each have accommodated another 2,000 evacuees at their work camps. On May 7, Syncrude shut down all site and processing operations, removing 4,800 employees from the area. On May 16, all 665 rooms at Blacksands Executive Lodge, a work camp, burned. Earlier that day, about 8,000 people were ordered out of 19 camps; about 6,000 remain. Today, the fire reached the Noralta Lodge, a few kilometres east of Blacksands. A quarter of Canada’s oil production, equal to approximately one million barrels of oil a day, was stopped as a result of the fires. The lost output is estimated to cost Alberta’s economy C$70 million a day, and is a contributing factor to the current rise in global oil prices. 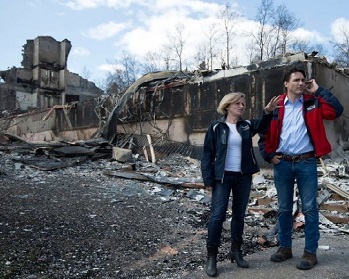 On May 13, Prime Minister Justin Trudeau visited Fort McMurray with Premier Notley to view the damage. Trudeau thanked all the first responders and city officials who are helping to put out the fire and promised that there will be ongoing aid from the federal government in the coming months and years. Officials have not as yet determined the cause of the fire, but they say its starting point was a remote area 15 kilometres (9.3 miles) from Fort McMurray. They point out that last winter was drier than usual, leaving a small snowpack, which melted quickly. As the fire started, an unusually hot, dry air mass hung over northern Alberta, bringing record-high temperatures to Fort McMurray. On May 3, the temperature climbed to 32.8°C (91°F), with relative humidity as low as 12 percent. The situation intensified on May 4 when temperatures reached 31.9°C (89°F) and winds gusted to 72 km/h (45 mph), contributing to the fire’s rapid growth. Australia, Israel, Mexico, the Palestinian Authority, Russia, Taiwan, and the United States have offered assistance in battling the blaze. Prime Minister Trudeau said that, while the offers were appreciated, they were unnecessary as firefighters from other Canadian provinces are gaining control of the situation. Initial insurance payouts could reach C$9 billion if the whole community must be rebuilt, making it the most expensive disaster in Canadian history.